ROB ZOMBIE guitarist John 5 believes that the last album he recorded with David Lee Roth will eventually be released. 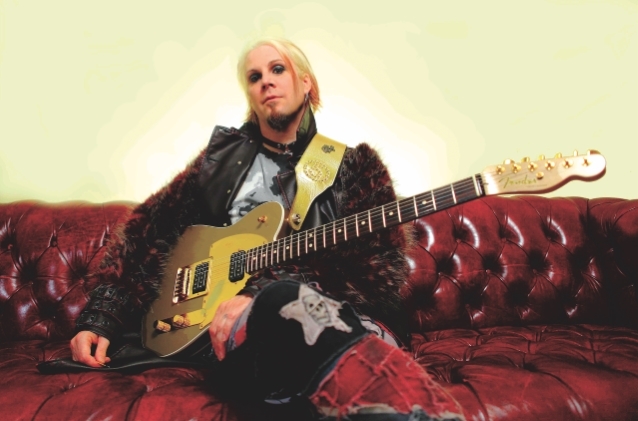 John 5, who got his first big break playing on Roth's solo album, "DLR Band", before landing stints with Marilyn Manson and now Zombie, told Metal Titans that he is hopeful that fans will get to hear his latest collaboration with the iconic VAN HALEN frontman. "I think it will see the light of day," he said. "I'm banking on it, because it's such a great record. "I can't say for sure, but I think Dave is working with VAN HALEN right now, which is wonderful," he continued. "I'm happy for him. That's one of my favorite bands. "I think it will come out when Dave is ready to release it. "I think you'll love it. It's a wonderful record. I'm so proud of the album." Back in 2015, John 5 told Guitar Player magazine that the sessions for his latest Roth album were remarkably relaxed. "I would just go to his house and I'd write these songs with him, and he would say, 'Let's go into the studio,'" John 5 explained. "So he would go to Henson studio and record these songs. They came out… They're so good. They're so good. And we've got Gregg Bissonette playing drums on it, and I played the bass, and they're really great songs." John 5 recounted one particularly funny episode that happened during the recording sessions for his latest collaboration with Roth. He said: "We [originally laid down all the guitar tracks] without click. 'Cause [Dave] wanted that natural feel. And I was, like, 'Great.' And he wanted to get drums on and some percussion, and the engineer was, like, 'Well, we're really gonna need click.' And I'm leaving for a tour with Zombie in, like, 40 hours… So [Dave] called me and he said, 'John, you've gotta come in and record the whole record again with click.' Now, we're talking overdubs, harmonies, doubling… everything. And I said, 'Dave, I'm going on tour in, like, 20 hours.' [He said] 'You've gotta do it. You've gotta come in and redo these guitars on the whole record.' Anybody else, I'd be, like, 'You crazy,' but it's Diamond Dave, and so I was, like, 'Okay.' So I went in there — I was exhausted — and I played this record to the click — everything; all the harmonies… everything. And [I] did it to click." The guitarist said that Roth's vocals on the album sound "like nothing you've ever heard. It's old VAN HALEN — sounds like 'Could This Be Magic?' or anything like that. It's just that sound, that tone." John 5 has been playing in Rob Zombie's band since 2005 and has been the longest-running member of the group. John 5 will release his new solo album, titled "Invasion", this summer.